The philosophy for Arras sparkling wines is simple, to create world class sparkling wines. Created by Australia’s most awarded sparkling winemaker, Ed Carr, outstanding fruit are sourced across Tasmania’s premium cold climate regions. The art of blending sparkling wine is one that can only be mastered by perfecting the craft, patience to allow the wine to mature at its own pace and the experience to know when it is at its best. We have remained true to this vision and are committed to cementing our reputation as being the best of the best and one of the great sparkling wine houses of the world. These wines express their age, they express their origin. This gives Arras a uniqueness which is our style – it’s an essence, it’s a magical part of winemaking to be able to take wines to this age. The entire portfolio of Arras sparkling wines are held back between 3-10 yrs to give these wines the distinction, quality and maturity they require to be world class, unique sparkling wines. A true prestige cuvée based on attributes of pristine Chardonnay and Pinot Noir from the finest Tasmanian vineyards, crystal clear in appearance with an enticing fine and persistent bead. This wine is medium deep straw in colour with a fresh gold hue. The bouquet displays lifted nuances of brown lime, butter biscuit and oyster whilst the palate reveals a complex flavour profile, exhibiting characters of honey, nougat, sourdough toast and truffle. A richly flavoured and intriguing palate, with a strong natural acid backbone, elegant structure and great persistence. 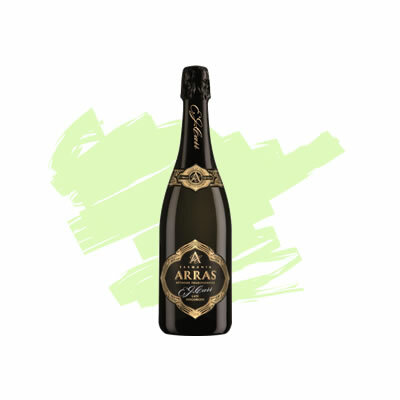 The wine retains a brilliant freshness and vibrancy – the hallmark of the House of Arras style. 1. Remove the tentacles and fins squid and chopping knife. 2. In a skillet, heat 30 ml (2 tbsp.) Of oil over medium-high heat. 3. Saute onions 2 to 3 minutes. Add garlic and flesh of chopped squid. 5. Bake 8 to 10 minutes or until the water discharged by the squid meat evaporates completely. 6. Add the chorizo ​​and cook for 2 minutes. 7. Remove from heat and add the parsley. 8. In a bowl, pour the mixture and add the breadcrumbs. Mix well. 9. Put the filling to cool a few minutes in the refrigerator. 10. Install your griddle on the grill and preheat to 260 ° C (500 ° F). 11. Stuff the squid body. Close to the end and keep using toothpicks. 12. Add salt and pepper squid. Pour 15 ml (1 tbsp.) Of oil on the griddle. 13. Cook the squid covered, for 5 minutes on each side. 14. Drizzle lemon juice, a little olive oil and sprinkle with chopped parsley.